Managing telephone number inventory, the mission-critical assets of communications service providers, is complex. There is pressure to ensure ample resources are available for sales. Numbers must be quickly and accurately assigned to customers. And regulatory reports must be in order and submitted on time. Add in the effects of industry consolidation and providers are challenged to manage data that is housed in multiple disparate systems, both legacy and acquired. Neustar NumeriTrack® provides a single, authoritative data repository for number resource inventory that eliminates the need, cost and complexity of accessing and managing multiple databases. 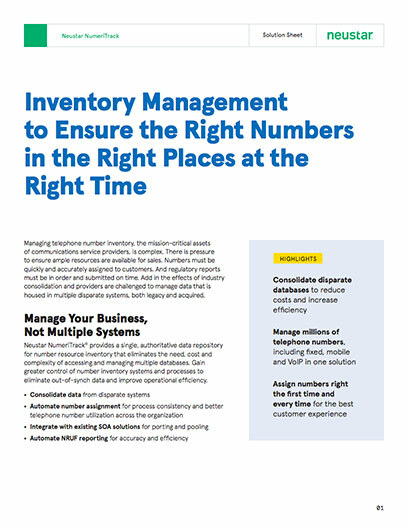 Gain greater control of number inventory systems and processes to eliminate out-of-synch data and improve operational efficiency. Be sure your customers have the best experiences at the most critical times: during upgrades, when contacting CSRs and during on-boarding. Enable them to retain their numbers when migrating to new or upgraded services; assign numbers right the first and every time; and enable CSRs to associate the same customer to multiple resource or service types. Consolidated databases also streamline CSR troubleshooting. In addition to providing a single telephone number inventory repository, NumeriTrack enables you to model data and use filters to view and manage segments to make informed business decisions across your organization. Network teams can view utilization and allocations based on network topography to make load balancing decisions. Code administrators can proactively manage the inventory by rate center to identify when to order new blocks and/or when to protect and donate blocks. Number administrators can quickly visualize and manage inventory according to FCC-mandated reporting requirements. Marketing teams can look at historical data and utilization trends in various areas to measure the success of a campaign by varying markets.